This highly concentrated shampoo combines our powerful AP4® Aloe Vera Complex, vitamins and essential botanicals to help improve the look of a dry, scaly scalp. Daily use helps reduce appearance of fine, flaky skin. Unlike other medicated shampoos, this exclusive salon formula smells great and gently cleanses hair while promoting shine and manageability. Vitamins and other soothing botanicals complement this shampoo to help promote healthy hair. I have used other brands, shampoos from my dermatologist and some home made recipes. This shampoo is the only shampoo that has my itchiness under control. I also get loads of compliments on my hair! I suffer from psoriatic arthritis. When I go into a flare usually its on my scalp, my hands and my knees. So ive tried other products but none helped. Recently I bought this product (Triderma soothing shampoo) and I must say its completly amazing. My psoriasis cleared up in 2 days! No more itching or burning and no more scales or bumps on my scalp. I am so happy I bought this product it is so worth it. Been a Psorasis sufferer for about 30 years. Most of those years I thought the scalp flakes were dandruff, so used the traditional coal tar and salicylic acid shampoos which helped but never eliminated the flakes. Even mixed the two together 50/50 for even better results. 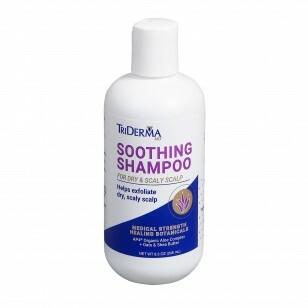 Triderma's shampoo is the only product that completely eliminates the itching AND scalp flakes. Wearing dark clothes now is no longer an issue. Thank Goodness! For best results, let stand on hair for 3-5 mins and also take a small amount of the shampoo and rub it behind the ears, if you have psoriasis there. You will see major results in 2-3 days. I used daily at first, then after flaking goes away, every other day to maintain. Pricey but delivers results, GREAT PRODUCT!! Soothing Shampoo eases the pain of my scalp. I have severe scalp psoriasis with significant hair loss. This is the only shampoo I have found that does not hurt or make my scalp tighten afterwards. Thank you. This product really helps me with my scalp psoriasis. Definitely something I will recommend to anyone who is going thru this, somewhat embarrassing skin condition. Thank You! I've tried many products to help ease the symptoms of my psoriasis over many years. After trying many things with no relief I started looking up solutions and came across the psoriasis lotion. I received a free sample of the shampoo and instantly fell in love. It relieved the itching and instantly improved the flakiness. I use it almost everyday! I tried the shampoo and it seems to be good for my skin. It lathers up well and does not have much of an odor to it. I have really short hair now as its summertime in Phoenix but what hair I do have, is shiny & easy to work with. This shampoo has conditioned my scalp and hair solving the problems I was having with tenderness at the hair roots with dryness and some scaly bumps. Used for about 2 weeks. I've gone from constant head scratching to not at all! Really like this shampoo. I am so thankful to finally find a product that soothes my dry scalp! I really appreciate a product without stinky coal tar or cortisone! Apply to scalp with warm water. Massage into scalp and leave on for 1-3 minutes. Lather & rinse. Use twice weekly or as needed. "I have suffered from psoriasis on my head and in my hair for 20 years. With the use of one tube of psoriasis control shampoo, my head and hair is almost 100% free of flakes and itching. I recommend this product to anyone who suffers with this aweful invasive condition." Mary, B. "Excellent product--very effective and does not ruin my color-treated hair. Leaves my hair in really good condition. I love it!" "Although this shampoo does not totally eliminate the scalp itching, it does help decrease the thickness of the plaque and it is great for colored hair! Doesn't strip the color at all!." Joanna, C.